This week’s season finale of Star Wars Rebels promises to pack an emotional punch for fans waiting to see Darth Vader and Ahsoka Tano duke it out, but on top of that, it may show that Disney’s Star Wars canon is accepting elements from a part of the old Expanded Universe many dearly miss: Knights of the Old Republic. 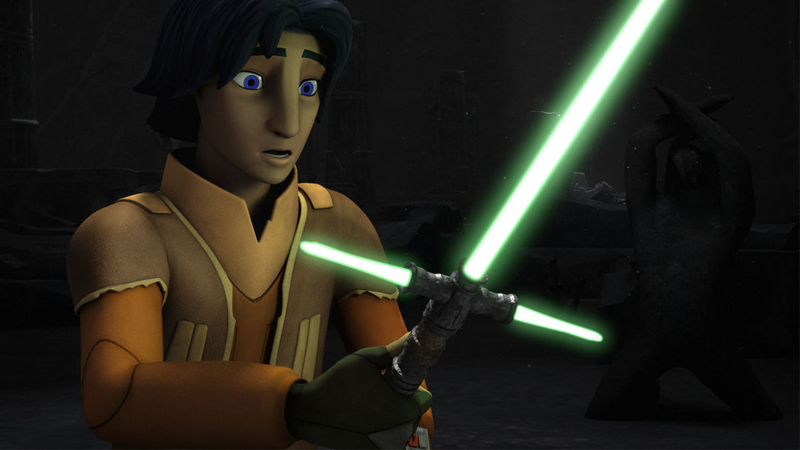 You’ll note the obvious nod to The Force Awakens when Ezra pics up a lightsaber that looks very much like Kylo Ren’s. But Malachor itself (and the horrifying surroundings the three Jedi find themselves in) dates back much further in Star Wars history. The official Force Awakens Visual Dictionary recently retconned Kylo Ren’s crossguard lightsaber as being an ancient design dating back thousands of years to the planet Malachor, but the world and its connection to the Sith were first introduced in the hugely popular Bioware role-playing video game series Knights of the Old Republic, or KotoR for short. In those games, Malachor (or specifically, Malachor V), was a stronghold of the Sith Empire millennia before the events of the movies, as well as the site of a huge battle between a faction of Jedi and the Mandalorians. That battle ended when the leader of that Jedi faction—the future player character of Knights of the Old Republic II—used a doomsday weapon that fractured the surface of the planet, killing thousands of Jedi and Mandalorians and turning Malachor’s surface into an ashen wasteland... something that, thousands of years later in the time of Star Wars Rebels, might look a little something like what you see above. It definitely seems like Rebels is pretty vigorously nodding at Knights of the Old Republic II with this—Kanan describes it as “a battlefield,” and Ahsoka follows up by saying that it looks like no one won whatever battle took place, which certainly describes the Battle of Malachor V in KotoR II. The “Old Republic” era, in which the KotoR games were set, has yet to be officially included in Disney’s revised Star Wars canon, causing much anger amongst of fans of the beloved games. Before The Force Awakens, many considered Knights of the Old Republic to be some of the best Star Wars material available in the old Expanded Universe—and these fans want the series recognized as part of the new Star Wars timeline. It seems like Disney and Lucasfilm might be throwing those fans one hell of a bone, but we’ll have to wait for the rest of Rebels’ finale, airing this Wednesday, to see if that’s really the case.